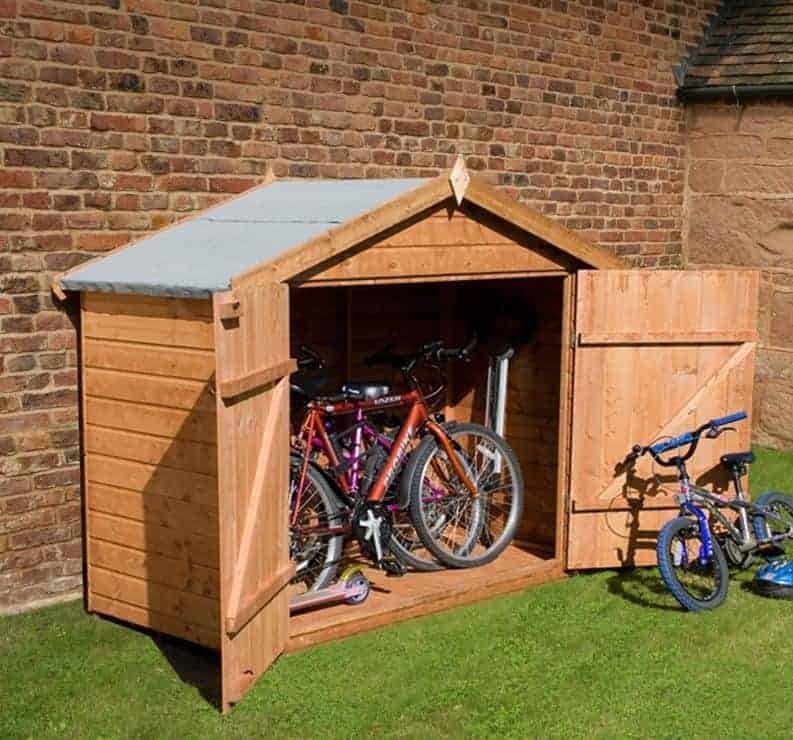 Keeping your own bike safe from the elements and making sure the kids bikes or even their toys are no longer scattered all over your garden has never been easier thanks to the 2.8 X 6.7 Windsor Bike Storage Shed. 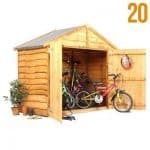 Offering a fantastic amount of storage for not just bikes, but also doing a great job as an actual shed make this low priced, high quality shed something that would be a great looking and practical addition to any garden. With its modern design this shed would fit in anywhere and thanks to the high end materials that it is made from it will be a shed that will be offering you a good amount of storage for a lot of years. This is a shed that has been designed to keep everything inside dry and secure. The tongue and groove cladding along with the apex style roof, work together to make it so no rain, no matter how hard it is belting down gets inside. Those attention grabbing double doors make it so getting bikes or anything else in and out of the shed is easy to do. It may be the price that first grabs your attention, but it will be the great look and the long lasting materials that will make this a shed ideal for you garden. 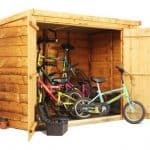 This well crafted and classically designed, bike store / shed offers a fantastic place for you to store the family’s bikes or even serve as an actual storage shed. Made with high quality timber this shed has just such a pleasant look to it that we feel many people will be surprised at just how low priced it is. 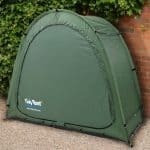 The shed offers you plenty of storage space, the width comes in at 6 feet seven inches and the depth is 2 feet 8 inches. This is more than enough size to fit in a few bikes if you plan on using it as a bike store or it can store a whole host of gardening equipment and other types of tools. The height of the shed offers enough headroom so that you can move around inside comfortably The ridge of the shed is 5 feet 8 inches so getting something like a bike in and out would not be hard at all. Using an apex style roof was very smart of Windsor. This style of roof is perfect for a bike store as there is no way the rain can get in through the roof and make your bikes all rusty. Not just that, but this style of roof will protect anything that you have inside here. The roof is made from 10 mm thick solid sheeting and it is covered by high quality felt to ensure the wood is well protected. This is a great roof that will not let a drop of rain get inside and spoil anything you have stored in here. While this shed may be just a little bit north of £200 the cladding that has been used certainly gives it a look of a £500 or more type of shed or bike store. The tongue and groove cladding looks great as it gives the shed a high quality overall look and feel. It is a very generous thickness to ensure that it will last for many years and be able to take getting hit with a bike or perhaps a mower every now and again as you put it inside and take it out. Tongue and groove cladding is just so great at keeping out the rain, we honestly feel like no matter what you store inside here be it a bike or a bunch of tools, no rain is going to be getting on them. We love tongue and groove cladding as it offers not only a great look, but also a lot of strength. Well to add to this strength, Windsor have made use of a very solid frame to hold the shed together. This 27 x 32 mm timber frame is very solid and when the shed is all built and you give it a little push, you will be very impressed with just how solid a structure this is. 10 mm solid sheeting is used for the floor just like it is in the roof and we are pleased with this. It is solid enough to easily take the weight of a few bikes, a lawn mower or whatever other types of gardening tools you may want to keep inside. The floor does not just sit on the ground as there are some good sized floor joists to help give the floor that extra bit of support. Windsor do make sure to give the shed a generous base coating of treatment before it is shipped to your house, but it is up to you to then treat it properly with some good quality wood treatment. It is actually best if you do this right away and then make it a yearly thing to really ensure that the shed is going to last you many years. Windsor are one of the best manufacturers when it comes to their guarantee. They offer a ten year anti rot guarantee on their sheds and this one is no different. Just be sure to know that for this guarantee to be valid requires you to treat the shed once it is built. While this shed can be used to store pretty much anything you could think of, Windsor clearly had bikes in mind when it came to designing the doors. You see this shed has a set of large double door which cover the majority of the front of the shed so when open getting bikes in and out of here is going to cause you no hassle or annoyance at all. In order for the doors to stay in place for many years, Windsor are using two large silver coated door hinges on each door. Add into this a pad bolt to close the door and you have one very good looking and incredibly practical set of doors. There are no windows on the Windsor Bike Storage Shed, but at the end of the day this is not a big deal as we feel that the look of this shed is best suited to having no windows anyway. Due to there being no windows there is no way that anyone can look and see what you have stored inside here. There are no issues with lack of privacy with this shed at all thanks to the way that the doors, when closed, offer no way for people to peek inside. The best way to customise your shed is with the treatment. You can buy wood treatment in a number of colours these days ranging from, red cedar to ivy green. So if you do want to add a little bit of colour and life to your shed doing it with the treatment is the most convenient way. This may be a low priced shed, but that does not mean it is low quality. 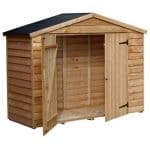 We are very impressed with just how high a quality a shed, Windsor have been able to make at this price range. As soon as you build the shed, you can tell it is going to last you for a number of years. But if you treat it right away and make an effort to look after the shed then there is no reason as to why this cannot be still in your garden for well over ten years. 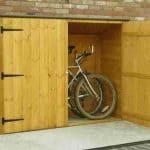 It does not matter if you are using this to store a couple of bikes or as a place to keep your gardening items safe. We feel that you are getting a generous amount of storage space for the low price. Working with a friend or family member should see you have this shed built in no more than three hours. Following the instructions properly and trying to enjoy yourselves while building it will help things go much more smoothly. 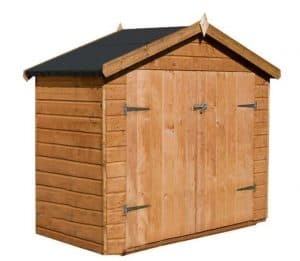 At not much more over £200, we feel that no matter what you are using this shed for, you will be getting a great deal. Final Thoughts: The 2.8 X 6.7 Windsor Bike Storage Shed is one of the best priced sheds we have seen in a while. The way the shed is made from that high quality tongue and groove cladding along with the strong floor, frame and of course apex roof really do make this a shed that is going to (with a small amount of TLC on your part) last for many years. With how good the price is and the excellent materials that are used it is actually easy to overlook just what a great looking shed this is. This is a shed we were very impressed with and if you are looking to add a bit extra storage space to your garden, but do it on a budget, then this is a great way to go about it.